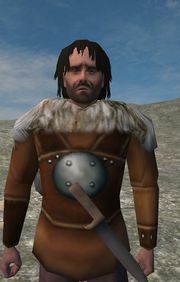 Borcha is a Khergit tracker and thief. As one of the two original companions, his role has changed somewhat throughout the versions. Originally a mid-level horse archer whose recruitment required the completion of an associated quest, Borcha now retains only his moderately high Intelligence and investment in some party skills. Although his recruitment dialog and his talk of life in his home village of Dashbiga still suggest he is a skilled horseman, his initial stats do not reflect this. In fact, he is now tied for the lowest starting Agility of the companions, while he once had the highest. However, at his low level there is room for expansion into different roles, and it would not be imprudent to invest in his or another companion's archery skills as his being a bandit will upset Deshavi. His initial Strength is also fairly low, so at first don't expect him to do too well when he has to defend himself with sword and shield. He's not a noble and has low Charisma. Borcha starts with Khergit Armor, Nomad Boots and a Knife. In Warband, he can be sent on a mission to Ichamur to determine the state of affairs in the Khergit Khanate. Sending him out to spread word of your claim will upset Lezalit and support the argument that you will deal with all men fairly and uphold the rights of the commons when attempting to persuade lords. This page was last edited on 30 October 2012, at 05:20. This page has been accessed 81,802 times.